Background Immunogenicity of anti-TNF-α drugs may affect both safety and efficacy. Several authors have found antibodies reacting against biological agents in the sera of rheumatic patients who failed a biologic therapy. Infliximab (IFX), a chimeric monoclonal antibody which contains 25% mouse-derived proteins, induces the formation of antibodies up to rates of 60%. 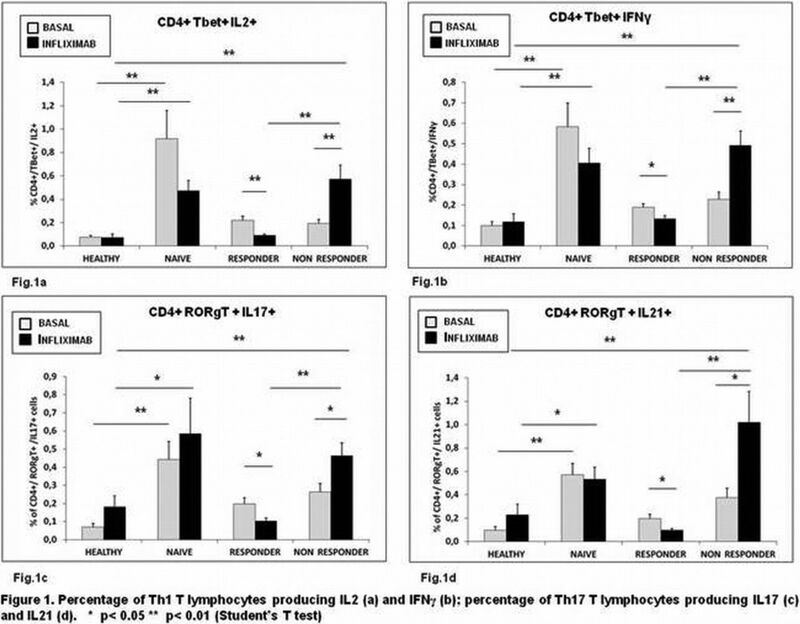 Some case reports and histological studies have demonstrated the involvement of the Th1 response following the immunization versus a TNF-α blocker. To our knowledge no study has still attempted to demonstrate that TNF-α blockers may induce Th17 responses. Objectives To investigate whether the immunogenicity of a biologic agent may affect the Th1 and Th17 compartment, after performing a validation assay of the test. Methods The whole blood samples was collected from a cohort of 10 healthy volunteers, 15 drug-free patients affected by rheumatoid arthritis (RA) according to EULAR/ACR 2010 criteria, 20 RA patients treated successfully with IFX and 20 RA patients who discontinued IFX due to a lack of efficacy or adverse events. Peripheral Blood Monunuclear Cells (PBMCs) were cultured in presence/absence of 50 μg/ml IFX. Th1 lymphocytes were identified as IFNγ, IL2- secreting, Tbet-expressing CD4+ T cells, and Th17 lymphocytes as IL17, IL21-secreting, RORγT-expressing CD4+ T cells. The variations in the percentage of Th1 and Th17 T cells following the treatments were analyzed by flow cytometric analysis. Data were analyzed with Student's T Test. Unpaired T test “type 3” for unequal variances with a two tailed P value (Excel) was used. Significance was set at P<0.05. 10 healthy subjects and 10 RA drug-free patients were used for validation assay. Results Twenty RA patients who had a loss of response to IFX or who developed an adverse event (females 16; mean age 61.3±12.2 yrs, mean disease duration 13.4±7.2 yrs) were compared with 20 matched RA controls (females 15, mean age 57.0±12.2 yrs, mean disease duration 18.1±9.5 yrs) successfully treated. Patients failing IFX developed Th1-Th17 responses following incubation with IFX 50mg/ml whereas responder patients did not. Indeed, IFX increased significantly the percentage of both Th1 and Th17 T-cell subpopulation (p<0.01and p<0.05, respectively) in patients failing IFX. In contrast, IFX incubation reduced significantly both Th1and Th17 T-cell percentage (p<0.05) in responder patients (Fig.1a,b,c,d). Conclusions Subjects affected by RA may have an impairment of peripheral tolerance, which could favour the development of an aberrant immunologic response against biological drugs. The loss of response as well as adverse events to IFX may derive from a paradoxical activation of Th17 or Th1 lymphocytes following sensitization, thus worsening the inflammatory status related to the underlying disease.